Hey, guys: You can be large or you can be loud. This is Sandra Tsing Loh with the Loh Down on Science, and a trade-off that makes monkeys howl. Howler monkeys, that is. They’re native to Central and South American forests. And they’re known for their loud calls, which carry for miles. This is courtesy of a cup-shaped bone in their throat called a hyoid. Humans have hyoids too. Which leads many parents to suspect their toddler is part howler monkey. Male monkeys howl partly in competition for females. European and American scientists wanted to know more about this. So they analyzed bones from museum specimens, and behavioral studies by other scientists. 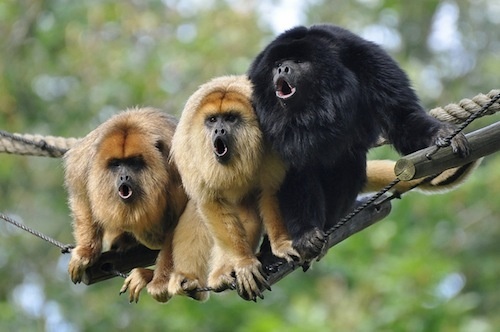 Here’s what they found: Male howlers with the biggest hyoids had the loudest calls. I know you’re thinking: Yes, yes, but what about their sperm count? Howling takes energy. Can males who are so loud also put energy into making sperm? The team says no. Males with the biggest hyoids had the smallest testicles! And yet they still had harems of females. Males with big testicles and small hyoids have voiced their complaints about this study. Very very softly.